If there is one thing you’ll learn about me, is that I love to travel; both domestically and internationally. Even before I had the means to travel, I’ve always been fascinated with places outside of my neighborhood. Places I would see and hear about on TV but many of which, I couldn’t point to on a map. So as I got older and opportunities came knocking for me to leave the comfort of my zip code, I wasn’t afraid to go, if anything I craved it. So far I’ve traveled to over 18 countries, mostly for work (conferences, training(s) and speaking engagements) and sometimes for leisure. With every city, I've learned something new about myself but more importantly, I gained a better understanding and appreciation for people and places that were once foreign. It has forced me to ask more questions, explore new places and recognized that the story of self is ingrained in the story of us. My first trip abroad took me to the city of London, where I met with Gordan Brown ( UN Special Envoy for Global Education): Former Prime Minister of the United Kingdom. This picture was taken in the Palace of Westminster, after a planning meeting with newly appointed youth representatives from ten different countries (UN Global Education First Initiative, Youth Advocacy Group), who were committed to working alongside Mr. Brown to fight for every child to have access to education. Paris, is truly one of the prettiest places I've ever been and I'm constantly trying to find time to go back. I should mention, the French truly know how to enjoy time and space... especially if is over bread, cheese and wine (the only food groups I recognize). In 2013, I was invited by the United Nations Children's Fund to provide youth perspectives during the "Education in the Post - 2015 Development Agenda: Regional Thematic Consultation for Western European and the North American States. 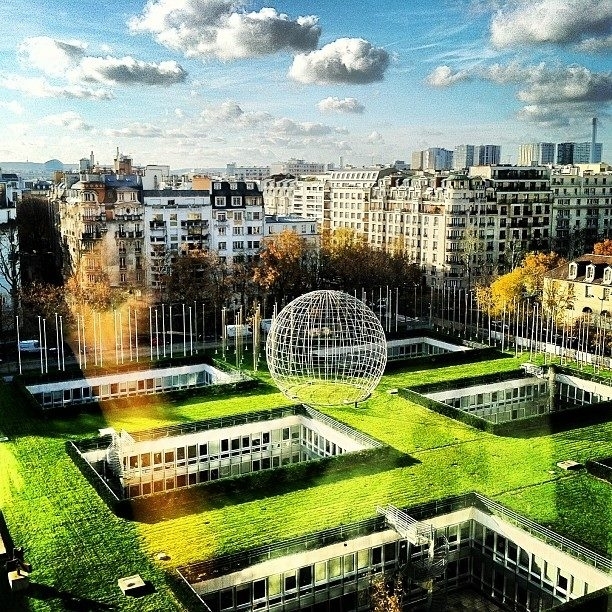 I took this picture inside the United Nations Educational Scientific and Culture Organization Paris office building. In 2015, I was invited to co-facilitate a training for 50 young people, from over 23 countries in Busan, South Korea on the principles of global citizenship education (GCED). This picture was taken, when I led a ceremonial candle lighting, to honor the fallen soldiers of the Korean War. In times like these, it's important that we remember our history, to prevent a repeat event and additional lives lost. Fun Fact: In 2013, I went to Russia and I doubt I would ever go back. Being a black girl in Russia was uncomfortable and at times a little scary ... trust I have stories for days. This picture was taken at Lake Seliger. In 2015, I was a delegate at the "Learning Metrics" Forum in Kigali, Rwanda, hosted by the Brookings Institute and Former Prime Minister of Australia, Julia Gillard. I was truly honored to be invited to represent the interest of youth, as we strategized ways to help create safe learning environments for every child, regardless of where they're born. This picture was taken in at Kimironko Market, where I had the opportunity to meet this lovely shop owner, who invited me to sit with her and over the course of that hour, we talked about everything from the genocide to the art of market negotiations. There was this one time in 2015, when I got stranded in Addis Ababa, Ethiopia, my flight back from Rwanda (had a layover in Ethiopia), was cancelled and the next flight wasn't for another 30 hours. The airline put me up in a hotel for the night and I decided to make the most of my visit because who knows, when I'll get the opportunity to go back. I got the hotel to rent me a driver for the day and he was kind enough to drive me around the city for the next 12 hours, it was probably one of the most jam packed days of my life. I saw so much, gain an appreciation for Ethiopian food and spent time dancing in a park with some of the cutest little humans ever. This picture was taken at the Entoto Kidanemhret Church, after visiting with students and exploring the school. So for three years in a roll, I was invited to speak at the Global Education & Skills Forum (GESF) in Dubai. The Forum brings together over 750 leaders from around the world to address the issues at the intersection of education. After my third year in attendance, I finally had enough time to travel beyond the conference center, so of course I took a desert safari tour... this picture was taken after my failed attempt to surfboard down a sand mountain... so I treated myself to henna. In 2015, I went to Doha, Qatar to lead a workshop at the World Innovation Summit for Education on authentic youth engagement and I got lost in Arabian sites and sounds. When I wasn't at the conference center, I found time to check out the clock tower, grab breakfast at the Souq Waqif and smoke hookah near the Doha Heritage Village. This picture was taken at the Katara Cultural Village. In 2016, I went on my first vacation and of course it had to be Mexico. A place I've obsessed about, ever since learning about the Mayan civilization in high school. 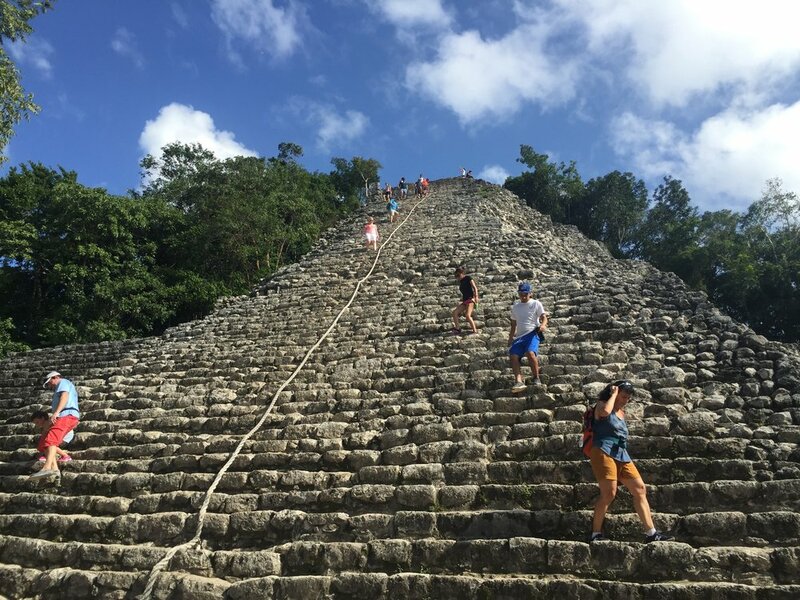 This photo was taken after climbing the Nohoch Mul Pyramid... oh yes I cried all the way up the pyramid and again on the way down. It was one of the scariest moments of my life but everyone was so nice and patient with me as I dominated the rope. That moment I didn't allow my fear of heights, to stop me from embracing the experience. Tulum, Mexico has a special place in my heart and can't wait to go back. 2016, I was invited to Bandar Seri Begawan, Brunei, to keynote their International Model United Nations for their high school students. There I spoke to over 300 students, from more than 45 nations at the International Convention Centre... oh and did I mentioned that the crowned princess was there? (funny... a lot of the students asked if I thought Trump would win and of course I said no:(... guess I was wrong) Theme for my talk "There is no age requirement to change the world". This picture was taken at the Sultan Omar Ali Saifuddin Mosque. Days after the 2016 Election, I left the country looking for peace. I found none but spent 6 days stuffing my face and exhausting myself by spending hours exploring Hong Kong, China. It's an amazing city with so many layers of culture. This picture was taken Thanksgiving day at the top of the Victoria Peak.